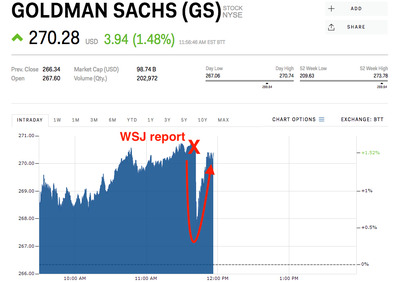 Shares of Goldman Sachs slid dramatically before recovering almost all of their losses Friday morning after the Wall Street Journal reported CEO Lloyd Blankfein is preparing to leave his post at the US’ largest bank by the end of the year. The stock is currently trading up 1.61% for the day, at $US270.64. The firm said it is not looking for outside candidates, and that his replacement will be one of Goldman’s co-chief operating officers David Solomon or Harvey Schwartz. Shares of the bank are up 5.7% so far in 2018.